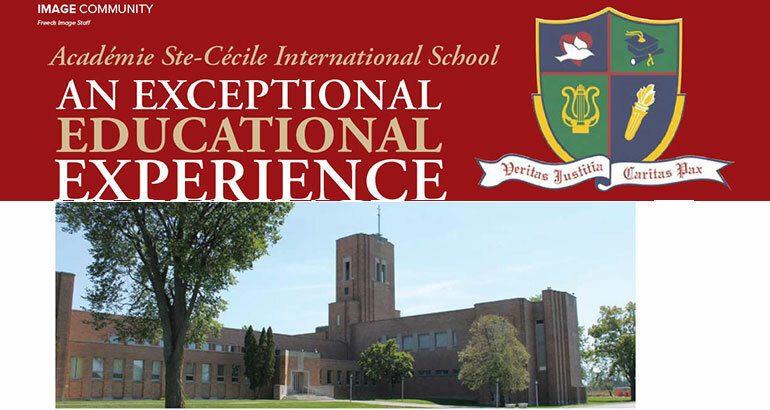 Small classes are only one of the many advantages that make Academie Ste-Cecile International School (ASCIS), Windsor’s most established private school, an exceptional educational experience. Since 1993, hundreds of high-achieving students have flourished in the school’s challenging but supportive atmosphere. According to its Vision Statement, ASCIS is designed to “educate, support and prepare students to meet life’s challenges with confidence.” A strong focus on values and core goals facilitates the development of the total child spiritually, physically, socially, emotionally, morally, and intellectually. While every student’s needs are unique, parents already know and appreciate ASCIS for its increased academic rigor, nurturing learning environment, authentically international character, and like-minded community of invested teachers, students, and parents. ASCIS challenges students to master a well-integrated curriculum. The Secondary School is inspected by the Ontario Ministry of Education and offers the Ontario Secondary School Diploma (OSSD) to all students. In addition to the OSSD, many students opt in to the International Baccalaureate (IB) Diploma Programme and/or the Advanced Placement (AP) Program. The IB programme is a comprehensive and rigorous two-year curriculum leading to examinations for high school students in their senior years of study. The IB Diploma has become a symbol of academic integrity and intellectual promise. The AP Program, on the other hand, is a challenging academic program designed to provide motivated high school students with post-secondary level courses. ASCIS also prepares students to sit the SAT and many standardied English proficiency examinations, including TOEFL, MELAB, and more. At the elementary level, ASCIS uses a strong academic curriculum centred on the acronym STREAM (Science, Technology, Religion, Engineering, Arts, and Math). As a compliment to ASCIS’s core subjects, French and Mandarin language classes begin in Junior Kindergarten. Weekly computer classes help prepare students for today’s technological world. Teachers are close at hand as students hone important web design, coding, robotics and keyboarding skills. Vocal instruction begins in JK, while twice-weekly instrumental music lessons enter the curriculum in Grade 5. Formal art and drama classes are also part of the curriculum. ASCIS is currently in candidacy with the International Baccalaureate Organization and has begun preparation to offer the IB Middle Years Program (MYP). The MYP is designed for students in Grades 7, 8, 9, and 10. The MYP provides a format that prepares students to be successful in school and to be active, lifelong learners by encouraging them to make practical connections between their studies and the real world. Students at ASCIS are supported by a strong team of highly qualified classroom teachers (OCT), a Student Services department, administrators, and a Dean of Academics. Some of the teachers hold doctoral degrees in different areas of specialty, such as Physics and Chemistry, and have taught at the university level. Working as a team, the ASCIS staff develops and implements student-centered programs to assist students to acquire the knowledge and skills required to learn effectively, live and work cooperatively and productively, be culturally sensitive with a wide range of people, and set and pursue education and career goals. ASCIS places a premium on low teacher-student ratios. In core elementary subjects like Math, Science, and English, classes typically include no more than 15 students and may even have as few as 5 or 6. Besides offering a greater opportunity for direct instruction, small class sizes enhance each student’s prospects of filling valuable leadership roles. Students also have greater opportunities to ask in-class questions and enjoy more time leading discussions and group activities. ASCIS prioritizes a plurality of extracurricular opportunities, and offers something for everyone. “We encourage our students’ involvement in pursuits outside of the classroom that are going to give them experiences and provide occasion for reflection and introspection,” says Pelland. Students successfully enjoy a variety of activities including sports, concert band, debating, a mock UN club, public speaking, spelling bee, chess, science fair, student council, and external competitions in math (including the University of Waterloo’s Gauss; Brock University’s Caribou Math; and Mathematica Centrum’s Thales, Byron-Germain, Fibonnacci, Pythagoras, Euler, Lagrange, and Newton), writing (the Harold Hewitt Scholarship competition, Polar Expressions, Bookfest, the Young Writer’s Poetry contest, and more), science (Windsor Regional Science, Technology, and Engineering Fair; Canada-Wide Science Fair; the University of Windsor’s Let’s Talk Science Challenge and Science Olympiad, and more), and art (gallery presentations and contests, Art Blitz, and more). Both the ASCIS Elementary and Secondary Schools field varsity teams in a number of popular sports. The Secondary School is a member of WECSSAA (Windsor and Essex County Secondary Schools Athletic Association) and competes in all sports with the exception of hockey and football. As a member of WCSA (Windsor Christian Schools Association), ASCIS Elementary School teams compete against other member schools as well as other private schools in the Windsor area. ASCIS annually hosts both volleyball and basketball for WCSA in its new state-of-the-art gymnasium. And the vision continues to take shape. Between 2011 to 2016, ASCIS has added an Olympic-size eight-lane track, a FIFA-regulated soccer pitch with artificial turf, an NBA-size basketball court and gymnasium with a raised running track, a weight/exercise room, a six-room addition to the elementary school, and – most recently – a cultural arts centre featuring music studios and an auditorium. Throughout the year, ASCIS students take part in team-building activities such as intramural sports, Wacky Water Day, Diversity Day, Spirit Week, and Canada Games day. These activities provide opportunities to be part of a team that strives to do its best, play fairly, make friends and, most importantly, have fun. Since many of these activities involve the entire school community from JK to Grade 12, older students have the ability to develop their leadership and organizational skills. Outside of regular school hours, ASCIS offers a concert band and jazz and flute ensembles, the first of which regularly performs in adjudicated competitions outside of Windsor. The Junior Choir (Grades 3 and 4) takes part in the annual Kiwanis Music Festival, and this year the Senior Choir is part of Music Express’s “The Wonder of Christmas.” As well, a culminating end-of-the-year concert involving the entire JK through 12 student population takes place at the Capitol Theatre in May. ASCIS’s strong pursuit in the arts also includes a yearly musical featuring the elementary drama and music students. Recent productions have included The Lion King and Beauty and the Beast. This year the students will be presenting Oliver. Students audition early in the school year and rehearsals start as early as November for the June presentation. ASCIS also maintains a close association with the Windsor Chess Club, which holds open lessons (not just for ASCIS students) on campus every Monday. Several students from ASCIS belong to this organization and have successfully competed at provincial, national, and world level tournaments. Once a week, a chess master from Kitchener visits the school to offer lunchtime instructions to ASCIS students, preparing them for the annual chess challenge held each spring at the Ciocario Club. 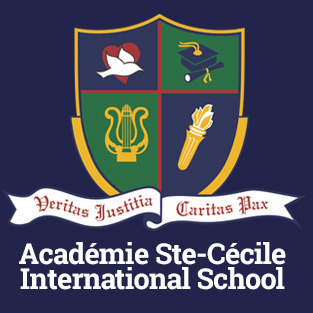 Académie Ste-Cécile has a true international flavour. Many of the local day students as well the boarding students come from all over the world and bring with them a mosaic of cultures, customs, and languages. These cultural differences are embraced and celebrated. Each year the school holds a Diversity Day where students are encouraged to come to school dressed in the clothing that represents their culture and heritage. They spend the day taking part in presentations highlighting the food, music, and customs of many of the countries that make up the ASCIS school community. ASCIS aims to create a campus culture in which students are intrinsically motivated to effect positive change outside of the school. Over recent years, through initiatives often directed by the school’s student councils, ASCIS students have put together filled Christmas shoe boxes with items for disadvantaged children in third-world countries, delivered an entire school bus full of food donations to St. Vincent de Paul, raised enough money to buy a goat for a family in a developing nation, transformed scores of recycled milk bags into pillows and sleeping mats for Haitian orphans, and donated dozens of sleeping bags, boots, and socks for Windsor’s homeless. ASCIS continues to work with charitable organizations like Hats on for Healthcare, the Hospice of Windsor, Street Help Unit 7, the Downtown Mission, and Habitat for Humanity. Parents who think that Academie Ste-Cecile Secondary or Elementary school would be the right school for their son or daughter are encouraged to call the school’s Admissions department for more information or to arrange a tour.